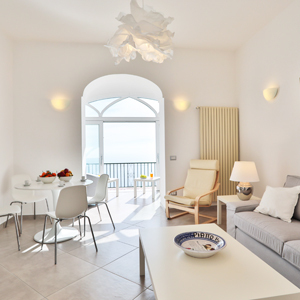 Erma is conveniently situated in the oldest part of Ravello and within a short walk to the town center and enjoys spectacular sea views. The house has been restored in the 2018 adding all modern comforts to include WI-Fi Internet access, portable A/C units, dryer, washing machine , satellite TV, winter heating, new kitchen equipment and utensils. It is tastefully furnished with modern tiles and white furniture; spacious rooms and large French doors enrich the beauty of the apartment making it extremely bright and airy. A L-shaped balcony, partially shaded by a wooden porch, runs the length of the apartment, offering views over the sea and the towns of Minori, Maiori and the cozy hamlet of Torello on a hillside below Ravello. The terrace is furnished with outdoor dining furniture and sun lounging chairs. Serene and peaceful, Erma is perfect for a romantic couple's getaway or a small group seeking a place to relax and enjoy the beautiful scenery of the Amalfi Coast. There are nature paths next to the house's door, which allow guests to reach Scala, Amalfi or Minori on foot, starting from a point high up in the hills, suspended between the sky and the sea where Ravello is situated. If you like walking, these are walks not to be missed: at every step brief glimpses of breathtaking views open up in front of your eyes and these will become unforgettable memories that will stay in your heart after your holiday has ended. A car is not necessary here , the local bus service is an inexpensive and a great way to get around the area if you don't want to drive. The SITA bus stop with a regular service to Amalfi is 10 minutes from the house . A car is useful for those keen on going a little further afield to Pompeii , Naples, Sorrento, etc And if you do have a car , a parking space for medium sized cars, can be reserved in a private area right below the apartment . Four steps lead to the main gate of the house, from the main gate, there are two staircases, for a total of an additional 32 steps to reach the entrance door of the house. Entering the door, a spacious corridor, gives access to the rooms of the apartment. The larger bedroom has a matrimonial bed ( 160x180) . It has direct access onto the balcony through an arched French door . The double bedroom features en suite bathroom which is equipped with a washbasin, a toilet , a shower and a window. The second bedroom has twin beds ( on request , they can be converted in a double bed), a beautiful open marble fireplace ( for decorative purposes only ) and French doors opening onto a balcony overlooking the Medieval town of Scala, situated in the hearth of the Lattari mountains and the winding Dragon Valley which separates Ravello from Scala. The living/dining room is roomy and airy . It is elegantly furnished with modern lamps, a large sofa and an armchair around a coffee table, a large flat-screen television, a round dining table with chairs which can accommodate up to six guests . An open arch, gives access to a second living area with 2 armchairs and a library. It features a French door opening onto the terrace with spectacular views. The terrace is equipped with 4 sun loungers. The kitchen can be reached from the living room and is fully equipped with 4 gas rings, dishwasher, microwave, electric oven, fridge, freezer and a French doors opening onto the porch, perfect location for outdoor meals while enjoying sea views . The porch is equipped with a wooden dining table shaded by a sun umbrella. The second bathroom is set at the end of the corridor. This bathroom is equipped with a washbasin, a toilet and a bathtub with shower stall. Adjacent to the second bathroom is the guest bathroom, further along the hallway is the laundry area with washing machine and dryer, iron and ironing board. Total final cleaning cost: : Euro 80.00 - For stays exceeding 7 days obligatory cleaning service on Saturdays Euro 80.00 to be paid on site.